DECIDER: Deb Forster, Clare Denkes, Carolyn McKeon, Catherine Joice, Shannon Tobin (with ball) and Stacey Byrne, Megan Kelly (obscured) and Kate Sherwin. 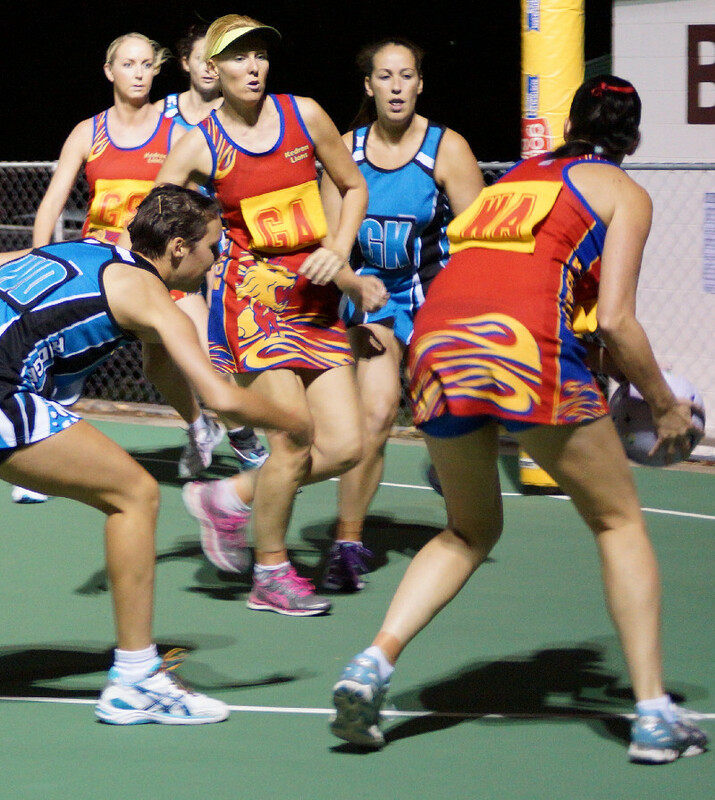 BELOW: Kedron Lions – GS Megan Kelly, GA Shannon Tobin, WA Debra Forster. Rawesomes – GK Kate Sherwin, GD Stacey Byrne, WD Clare Denkes. IN THE Athlete’s Foot Chermside A-Grade final, undefeated minor premiers Rawesomes easily disposed of the competition bolters, Kedron Lions Red, who played the final in honour of a dear friend and former teammate, Janice Gutugutuwai, who is fighting terminal Desmoplastic Small Round Cell Tumor (DSRCT). Though they played with their hearts, Kedron Red just could not match Rawesomes in any area of the court and Rawesomes extended their lead in every quarter of the game to run out 59–35 winners. As predicted, the key player for Rawesomes was goaler Nicole Forbes, whose height and reach was too big a challenge for the Kedron defenders. Forbes was named Player of the Final for her contribution on court. 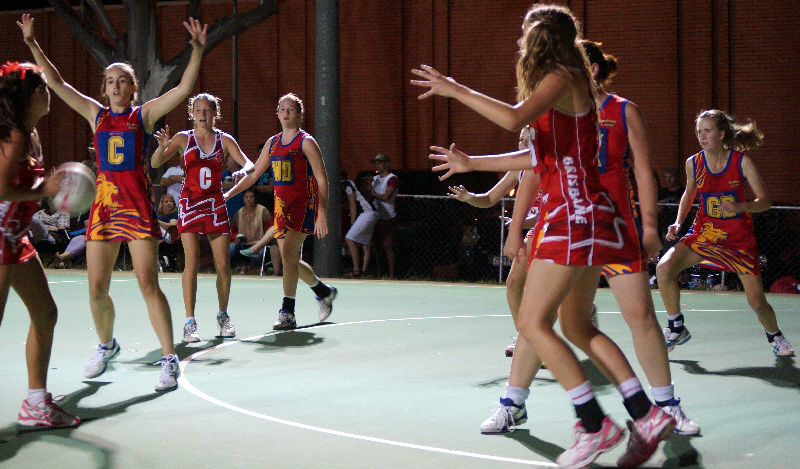 Sign up for Northside netball news and photos. 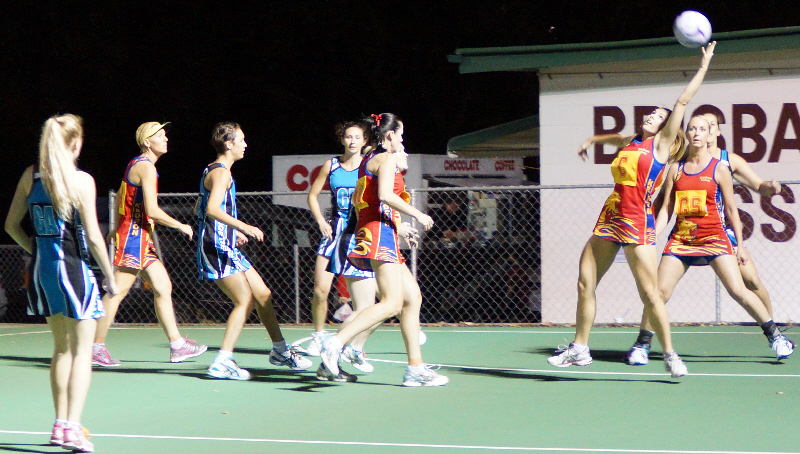 In the A-Reserve final (below), the BNA’s development team, TIP 3, outgunned Kedron Lions Blue. TIP 3 set up their win in the first quarter with a blistering score of 18-3. With near perfect goaling from young guns Teeghan Hess and Gabi Pokia, Kedron Blue didn’t have any crumbs to pick up to help their score along. With the same combination in play for TIP in the second quarter, and a slightly improved performance from Blue, the score was a bit closer but at half-time, TIP had set up an unassailable 36 – 10 lead. TIP’s Georgia Giles (with ball), Kedron centre Amy Carmichael, TIP centre Nandia Els, Kedron WD Kaitlin Tuite, Kedron GS Sinead Cronin, TIP player closest to camera is GS Sarah Strong. TIP took their foot off the pedal and changed their combination in the second half, giving Blue a chance to fight back. Giving Kedron Blue credit, they did outscore their opponents in the second half, but the 26 half-time deficit was too much to pull back and TIP comfortably took the prize with a 52-31 win. Rawesomes GA Rebekka Jacobsen, Kedron GA Shannon Tobin, Rawesomes WD Clare Denkes, Rawesomes GD Stacey Byrne. Middle at front is Kedron’s Debra Forster and mostly obscured by her is Rawesomes’ centre, Carolyn McKeon. Kedron C Catherine Joice, Kedron GS Megan Kelly, and Rawesomes GK Kate Sherwin. THERE’S very little down time at the BNA with the association’s winter seasons kicking off before the end of the month. Team registrations for both the winter day and winter night competitions close on Monday. The day competition starts on Saturday, March 15, with the night competition beginning the following Wednesday night, March 19. Please contact the BNA office on 3350 2035 or admin@brisbanenetball.org.au for assistance with team and individual player registration.